Submitted by Norm Roulet on Tue, 07/06/2010 - 07:54. In Losing Our Cool, I show how indoor climate control is colliding with an out-of-control outdoor climate. In the United States alone, energy consumed by home air-conditioning and the resulting greenhouse emissions have doubled in just over a decade; energy used to cool retail stores has risen by two-thirds. Air-conditioning is approaching 20 percent of year-round electricity consumption by U.S. homes, the highest percentage in history. But air-conditioning has shaped human life in other, sometimes unexpected ways that go far beyond the monthly utility bill. Submitted by Norm Roulet on Mon, 07/05/2010 - 14:14. Submitted by Norm Roulet on Fri, 07/02/2010 - 22:25. For additional information concerning the air quality forecast, contact one of the following agencies, or visit http://airohio.epa.state.ohs . Submitted by Norm Roulet on Thu, 07/01/2010 - 22:43. Joe Koncelik's Ohio Environmental Law Blog recently reported "Benefits of Biomass Power Questioned - Implications for Ohio", about a renewable fuels permitting issue that has surfaced with a FirstEnergy coal powerplant being converted to biomass, which offers great insight on the development and future of our biomass industry, and links to valuable source material for those considering the economic and environmental future of energy in Ohio, America and worldwide. In this excellent posting, Koncelik points out, "
Ohio's best hope for reducing its overwhelming dependence on coal for electricity generation is biomass. While wind and solar have significant benefits, it is unquestioned that current technology does not allow these renewable sources to be forms of base-load power generation. Biomass does have that potential in Ohio, as is evidenced by the recent announcements of the conversion of 312-megawatt First Energy's Burger coal-fired power plant to biomass generation. Now that proposal is meeting opposition by environmental groups. As reported in Biomass Magazine." In fact, environmentalists and regulators are demanding that FirstEnergy identify what biomass they intend to use from where to power their proposed-to-be "renewable" fuel plant - that is good economics and environmentalism. The dynamics of the Burger plant application are interesting and important for the future of the biomass sector in Ohio - while Ohio has a bright biomass renaissance ahead, we are still in the dark ages of its development. Submitted by Norm Roulet on Thu, 07/01/2010 - 06:29. The WHO, WIPO and the WTO are jointly organizing a Symposium at technical level on Access to Medicines: Pricing and Procurement Practices on July 16, 2010 at the Centre William Rappard in the WTO in Geneva. The purpose of the symposium is to learn what international and regional agencies have experienced in the pricing and procurement of medicines as important determinants of access. It will also provide an opportunity to discuss where to obtain information on access to medicines, their prices and their availability. The core questions are about drug procurement, pricing and relevant intellectual property issues. The discussions will be technical, serving as a forum for participants to share information, views and practical experiences. Submitted by Norm Roulet on Wed, 06/30/2010 - 08:29. Last month, the The Canadian Renewable Fuels Association released the first ever comprehensive third party assessment of the economic impact of the 28 renewable fuel plants in Canada and renewable fuels investments in Canada. The assessment conducted by econometric firm Doyletech Corporation, concluded that, “the grand total of the annual positive economic impact of renewable fuels is $2.013 billion”. Most interesting, from the perspective of developing this industry in Ohio (and it is developing here) is the report finding that: "All levels of government gain from renewable fuels plants. In light of the net benefits to governments at the provincial and federal levels being in the hundreds of millions of dollars, and many millions at the municipal level, it would seem that incentive programs to encourage biofuels production and use in Canada have been a wise investment." Submitted by Norm Roulet on Mon, 06/28/2010 - 02:46. Optimising Harvesting and Storage Systems for Energy Crops in The Netherlands. 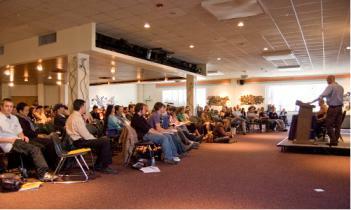 Dr.Ir.Willem.Huisman - Wageningen University, Netherlands, Dept. Agrotechnology and Food Science, Farm Technology Group. Biomass crops for energy production can be produced in many ways. The choice of the best harvest and storage methods is defined by many conditions like: requirements of the applied fuel conversion technology, requirements as defined by co-firing, local climate, available technology, transport infrastructure, cost levels of the various inputs, available subsidies. The selection criteria can be: minimal costs or energy input, maximum financial or environmental profit or maximum energy output. The selection process should be based on optimisation of the whole chain, including pre-processing, rather than on single operations. A simulation model is being built to support the selection of the optimal production chain. In this paper the farm operations of harvest and subsequent drying, storage and pre-treatment will be presented in order to discuss the aspects related to the optimisation of bio-energy chains from the farm to the gate of the conversion plant. This paper will deal with fibre crops for direct combustion or gasification. We consider the perennial grasses: miscanthus, reed canary grass and switchgrass, the short rotation woody crop: willow and the annual crop: hemp. The advantage of an annual crop is that after the decision to produce is taken, in just one season the required biomass can be produced. Submitted by Norm Roulet on Mon, 06/28/2010 - 00:56. CONCLUSIONS: The state of Ohio's greatest challenge is likely to be in adapting to climate change along its waterways and on Lake Erie, as this is where the most significant economic and ecological impacts will occur. Building and maintaining an alternative transportation infrastructure would allow Ohio to maintain its vibrant manufacturing industry amidst sea-shipping uncertainty, but the costs of the sort of adaptation needs to first be researched. Natural areas such as forests and lakes will suffer from climate change. The ecological integrity of Ohio’s natural landscape will be threatened in the coming century and it is recommended that management of resources be carefully monitored to ensure the wellbeing of the economic and cultural functions that depend on them. Lastly, because flooding events are likely to occur more often, preparations to prevent and mitigate floods and flood related disasters could be made ahead of time. Submitted by Norm Roulet on Sun, 06/27/2010 - 21:59. 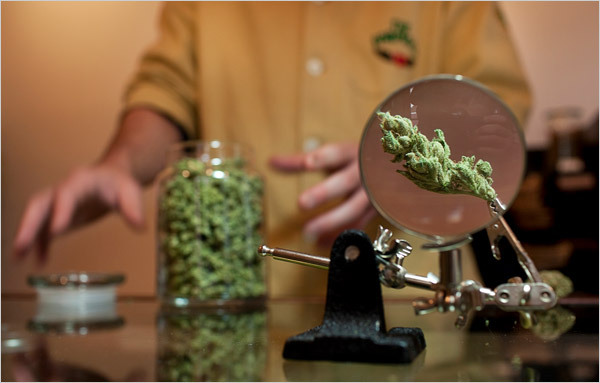 At the Farmacy in Boulder, Colo., medical marijuana is sold in a boutiquelike atmosphere. State law lets sellers profit as much as they can, as long as they stay within a labyrinth of rules. ANYONE who thinks it would be easy to get rich selling marijuana in a state where it’s legal should spend an hour with Ravi Respeto, manager of the Farmacy, an upscale dispensary here that offers Strawberry Haze, Hawaiian Skunk and other strains of Cannabis sativa at up to $16 a gram. She will harsh your mellow. Since this place opened in January, it’s been one nerve-fraying problem after another. Pot growers, used to cash-only transactions, are shocked to be paid with checks and asked for receipts. And there are a lot of unhappy surprises, like one not long ago when the Farmacy learned that its line of pot-infused beverages could not be sold nearby in Denver. Officials there had decided that any marijuana-tinged consumables had to be produced in a kitchen in the city. Submitted by Norm Roulet on Sun, 06/27/2010 - 14:49. I have been disturbed to live in a community where pollution is a serious health crisis, and I am surrounded by smart young people, yet nobody seems to care they are being poisoned. The worst demonstration of that is the movement to put a bicycle lane along side a major pollution and so health hazard - the I-90 freeway bridge elevated high into the polluted air of the Cuyahoga River Valley, in downtown Cleveland. Clearly, there are engineering and construction cost increases to include such a feature on a freeway bridge - costs society may afford - but what are the negative externalities associated with such a bridge feature, which would encourage individuals to exert themselves in immediate proximity - within a few feet - of a known carcinogen - vehicular emissions. This would also encourage people to spend increased time exerting themselves in an elevated point above other Cleveland pollution, like the toxins from Cleveland Thermal and Mittal, also in close proximity to the bridge. As there is proof that short term exposure to such pollution increases risk of serious short and long-term health consequences, it is certain such a bridge feature would increase healthcare costs, human suffering and mortality rates in this region, as it would harm the health and shorten the lives of those who use it. To the extent the feature encourages broad public use, the harm could be very significant - the equivalent of 100s of life-years lost, and more. What is the cost of genetic mutation among our young? External costs associated with putting a bike lane on the I-90 freeway bridge would far exceed the cost of the bridge itself. Submitted by Norm Roulet on Sun, 06/27/2010 - 03:33. Developers and farmers continue to pave the way for hemp as a biomass crop in the United States. The U.S. Appeals Court in St. Paul, Minn., heard arguments Nov. 12 by two North Dakota farmers trying to get a lower court’s dismissal of their suit against a federal agency overturned. David Monson, Osnabrock, N.D., and Wayne Hauge, Ray, N.D., have state approval to grow industrial hemp in North Dakota, but are suing the U.S. Drug Enforcement Administration to get a federal permit to grow industrial hemp. Hemp is related to the illegal drug marijuana and under federal law some of the industrial hemp plant is considered a controlled substance. The three-judge appeals panel will issue a written decision, but that isn't expected to be available for several months. In Massachusetts, a developer sourced the hemp he used for product evaluation from Canada where the crop is legally grown. Jim Pillsbury of Framingham, Mass., is developing hemp for heating pellets. In 2007, Pillsbury had a Canadian prototype biomass research facility, ViFam Pro Services of Kirkland, Quebec, test hemp leaf biomass for heating pellets which were then analyzed at the Twin Ports Testing Labs in Superior, Wis. Submitted by Norm Roulet on Sat, 06/26/2010 - 00:13. Northeast Ohio- There is potential for high ozone pollution levels Saturday, June 26, due to high-temperature conditions. Pollution may reach levels considered "Unhealthy for Sensitive Groups" during the afternoon or early evening hours in areas not subject to rain. Submitted by Norm Roulet on Mon, 06/21/2010 - 17:23. After nearly 10 years of research and development in industrial hemp, Stonehedge Bio- Resources Inc. of Sterling is ready to lead the way in commercializing hemp in North America. Building on a business case developed through the Eastern Lake Ontario Regional Innovation Network (ELORIN), Stonehedge is now set to establish a bioprocessing facility in Eastern Ontario to serve North American markets. Some of the products and co-products are aimed at the automotive, energy, agriculture, construction material, and pulp and paper markets. This fibre separation facility (decortication plant) is expected to provide new farm income for about 200 farmers, putting more than 12,000 acres into cultivation, said John Baker, president and founder of Stonehedge. They secured $2 million in funding from Great Britain and met with the British Consulate on Wednesday, Northumberland County chief administrative officer Bill Pyatt told County council Wednesday afternoon. "Hopefully they'll be able to obtain provincial and federal dollars as well," Mr. Pyatt said. "This industry will supply all of North America." Submitted by Norm Roulet on Mon, 06/21/2010 - 16:34. Submitted by Norm Roulet on Mon, 06/21/2010 - 16:12. Miami Beach voters could cast ballots for Mary Jane come November should a budding effort to decriminalize marijuana possession in the city gain traction. In front of City Hall Wednesday evening, the Committee for Sensible Marijuana Policy announced a drive to gather signatures in support of a proposed amendment that would make ``personal'' possession of marijuana in Miami Beach a civil code violation punishable by a mere fine. ``We're empowering local government to deal with this differently,'' said Ford Banister, the group's chairman. Banister hopes to put the proposal before the city's voters in November. Submitted by Norm Roulet on Mon, 06/21/2010 - 15:56. Angered by a pair of bills aiming at regulating the state's burgeoning medical marijuana industry just signed into law by Colorado Gov. Bill Ritter (D), one group of medical marijuana advocates has announced plans to get a marijuana legalization initiative on the ballot in 2012. But there is already another legalization initiative filed with state officials and ready to go. The competing efforts suggest a certain fractiousness in the state's increasingly crowded and complex medical and recreational marijuana communities, but they also illustrate the growing momentum toward legalization on the ground in Colorado. Just last month, a Rasmussen poll showed marijuana legalization hovering on the cusp of majority support, with 49% of likely voters approving, 38% opposed, and 13% undecided. A 2006 legalization initiative got only 39% of the vote. The initiative effort in the news this week is called Legalize 2012, and is being led by the Boulder-based education and advocacy group Cannabis Therapy Institute (CTI), which is deeply unhappy with the new regulations provoked by a massive boom in dispensaries in the past year or so. "The problem we have in Colorado is that the medical marijuana amendment didn't set up a distribution system, and now, 10 years later, that flawed language is coming back to haunt us," said institute spokesperson Laura Kriho. "The only way to cure the problems patients are now having is across the board legalization for all adults. It will simplify things for law enforcement, patients, and people who aren't patients." Submitted by Norm Roulet on Mon, 06/21/2010 - 15:41. Tip of the Hat and Props to the Cleveland Plain Dealer's Michael McIntyre, and his Tipoff column today - First Reporter to Recognize "A new cash crop" for Ohio. I look forward to discussing this initiative in detail with Michael and others in the media and public, as it is important to educate the community on the economic benefits we will receive from "Growing a Bright Green NEO PAC for Legalization & Commercialization of Cannabis Crops, Products & Services". Some Northeast Ohio boosters are pushing for a new product to revive the local economy: Marijuana. And, no, stoners, they're not talking about boosting sales of Doritos. Norm Roulet of the RealNEO blog announced last week that a political action committee, Real Green NEO PAC, was formed to push for a November ballot issue for "enlightened legalization of cannabis crops." Submitted by Norm Roulet on Sun, 06/20/2010 - 11:12. In 1998, Canada legalized hemp as a product and began national development of hemp related industries. Prior to making that decision, analysts consider the economic cases for and against developing the hemp industry in their nation - a major decision - and they decided: RECOMMENDATION: Legalize commercial hemp production, the sooner the better to capitalize on first mover advantage. Since then, Canada has certainly taken a "first mover" advantage with the hemp industry and developed a bright green economy, with $10s billions in national benefits providing 100,000s of jobs in their nation, in about a decade. Submitted by Norm Roulet on Sun, 06/20/2010 - 10:02. The former Alaska governor appeared on Fox Business Network last night, along with libertarian-leaning Republican Rep. Ron Paul. That's right, pot smokers: You have something of an ally in Sarah Palin. The former Alaska governor appeared on Fox Business Network last night, along with libertarian-leaning Republican Rep. Ron Paul. Paul is a longtime advocate of decriminalizing drugs at a federal level and leaving the issue to the states, something Palin would not endorse. "If we're talking about pot, I'm not for the legalization of pot," Palin said, as Politico first noted. "I think that would just encourage especially our young people to think that it was OK to just go ahead and use it." But she went on to say that police should not focus on arresting people who use marijuana recreationally. "I think we need to prioritize our law enforcement efforts," Palin said. "And if somebody's gonna smoke a joint in their house and not do anybody else any harm, then perhaps there are other things our cops should be looking at to engage in and try to clean up some of the other problems that we have in society." Submitted by Norm Roulet on Sun, 06/20/2010 - 09:00. 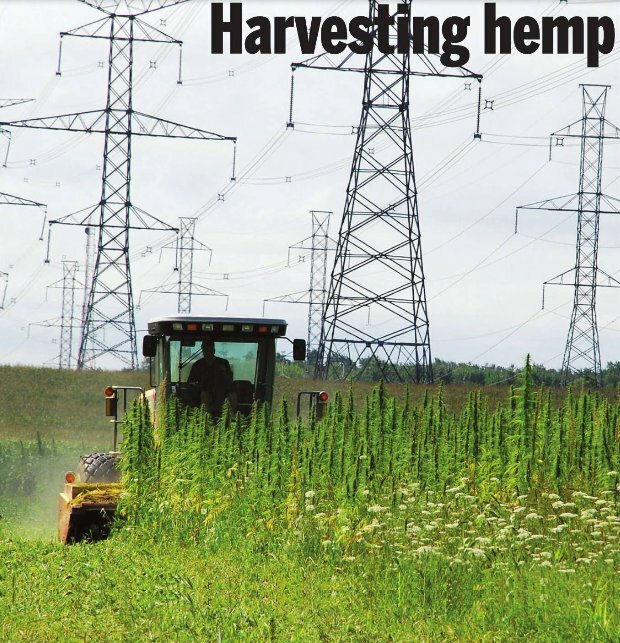 The following article from Napanee Guide highlights some of the valuable partnerships between agriculture, environmentalism and industry developing in Canada, where industrial hemp has been legal for about a decade. While is has taken years for the industry to capture scale, there are now innumerable examples of important innovations in this bright green economy in Canada that demonstrate what the US economy is losing by neglecting R&D and growth in this industry. Smart states are bypassing federal incompetency and developing home-rule cannabis economies, despite Washington DC. Here is the type of innovation and environmental benefit they stand to gain, as first movers in this $trillion absolutely certain bright green future for Ohio. In a white cloud of pollen, 43 acres of hemp was harvested from Hartacre Farms last Tuesday. Herb Hart grew the crop in partnership with Performance Plants Inc. of Kingston, as part of a biofuels project for Lafarge Bath Cement plant, which is working on methods of reducing their reliance on fossil fuels. Submitted by Norm Roulet on Sun, 06/20/2010 - 08:41. WASHINGTON, D.C. — It was announced today that Sativex, a cannabinoid-based liquid medicine sprayed under the tongue, has been approved for use in Great Britain to help treat the muscle spasticity suffered by multiple sclerosis patients. Sativex is a natural marijuana extract that is produced by British-based GW Pharmaceuticals. It has been approved for use in Canada to treat neuropathic pain since 2005. Submitted by Norm Roulet on Sat, 06/19/2010 - 11:00. The people of Northeast Ohio should be highly concerned about our air pollution, for many reasons. 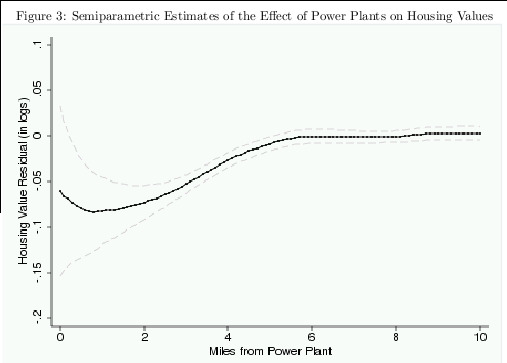 A most recent reason for concern: the May 2010 study "The Effect of Power Plants on Local Housing Values and Rents" finds "3-7 percent decreases in housing values and rents within two miles of plants with the semiparametric estimates suggesting somewhat larger decreases within one mile. In addition, there is evidence of taste-based sorting with neighborhoods near plants experiencing statistically significant decreases in mean household income, educational attainment, and the proportion of homes that is owner occupied". That is a strong analytic foundation for finding much of Cleveland is statistically worth significantly less than cleaner areas of Northeast Ohio and cities in America (as also reflected in our low property values here). Submitted by Norm Roulet on Sat, 06/19/2010 - 00:38. Submitted by Norm Roulet on Thu, 06/17/2010 - 14:28. To many people, the most familiar forms of renewable energy are the wind and the sun. But biomass (plant material and animal waste) supplies almost 15 times as much energy in the United States as wind and solar power combined—and has the potential to supply much more. There are a wide variety of biomass energy resources, including tree and grass crops and forestry, agricultural, and urban wastes. It is the oldest source of renewable energy known to humans, used since our ancestors learned the secret of fire. Submitted by Norm Roulet on Thu, 06/17/2010 - 11:34. The June 15, 2010, Toledo Blade published an important editorial titled To curb Ohio's costly coal bill, fix U.S. energy policy, by Jeff Deyette, assistant director of energy research and analysis in the Union of Concerned Scientists' climate and energy program, and Alan Frasz, vice president of Dovetail Solar and Wind in Chagrin Falls, Ohio, that leads-off with an important observation most residents of Ohio find hard to believe... "When you turn on your coffee pot in the morning, the power likely comes from coal, which generates 85 percent of the electricity in Ohio. According to a new report, three-quarters of that coal comes from elsewhere". Yes, Ohio is ADDICTED to dirty, expensive, environmentally destructive imported coal - Ohio electricity ratepayers spent $1.5+ billion in just 2008 on imported coal - Ohio is the 5th biggest imported coal junkie in America, and we have the pollution to prove it. Importing coal to produce electricity is a drain on Ohio's economy. Ratepayer dollars are diverted out of state, instead of being spent locally on renewable-energy projects and energy-efficiency measures that can provide the same electricity service while directly benefiting residents and creating jobs. The report by the Union of Concerned Scientists, "Burning Coal, Burning Cash," ranks states that are net importers of domestic and foreign coal. Ohio is one of 38 states that depend on imported coal. The state spent $1.5 billion on net coal imports in 2008, making it the fifth most dependent state. First Energy's Bay Shore plant in Oregon imported all of its coal, shelling out $64 million mostly to Wyoming. Most domestic coal comes from Wyoming, West Virginia, and Kentucky. Some states import coal from overseas, as far away as Colombia and Indonesia. It doesn't have to be that way. Ohio has significant wind, biomass, and solar-power resources, and we've only started tapping into that potential. The Elephants Journey - Lawrence Anthony - The Elephant Whisperer - This is an amazing story. Full of wonder. 04.08.05 City Club: Terrorist Profiling: Safer Airlines or Violation of Civil Rights?